Just wanted you to know that these sweet and chewy paleo vegan pecan pie bars are sponsored by my friends over at Amoretti! These easy, healthy pecan pie bars are only 8 ingredients and have a pumpkin spice spin! A gluten/grain/dairy/egg free dessert for Thanksgiving! 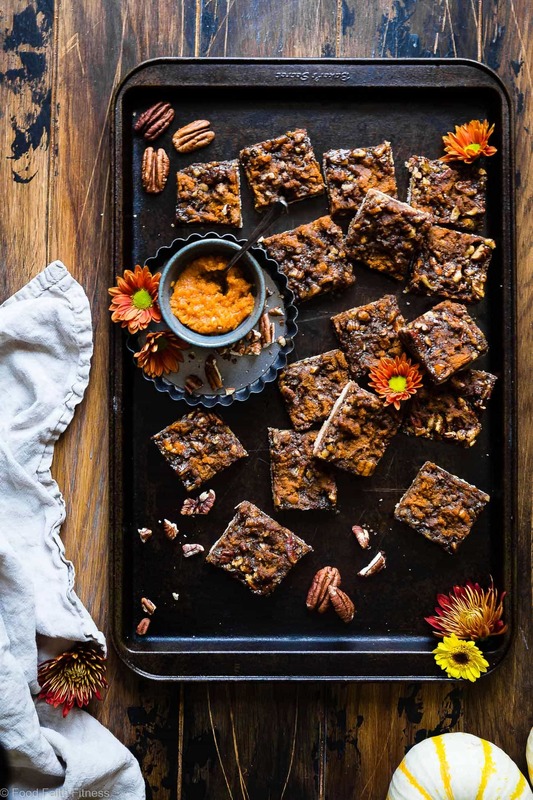 You thought that we could not get any more “pumpkin spice” beyond pumpkin spice paleo magic cookie bars and paleo waffles with pumpkin spice cream sauce, and then THESE easy vegan pie bars. I may have even snuck in some gluten free vegan PUMPKIN cinnamon rolls. What can I say? I am NOT a woman of mystery. If I make you something you can PROBABLY expect that I am going to throw it at you eleventy billion ways, until you no longer want to ever see pumpkin spice again. SORRY NOT SORRY. Except, let’s be real, you want to see pumpkin spice-flavored food forever and ever the end. I KNOW HOW YOU THINK. Internet peeps. 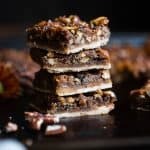 I thought we nailed it with chocolate paleo pecan pie bars, but these crispy-yet-CHEWY bars, with their stupid-easy-coconut-flour vegan pecan pie crust? OH BOY OH BOY OH BOY. Your Thanksgiving-food-lovin’ mouths are in for a TREAT. From their crunchy-spiced-crust to their SUPER NUTTY, toasty, pecan-centric topping, that has JUST the right amount of chewy, these paleo pecan pie bars are going to be stealing the show on your holiday table. Last week we agreed that “turkey day” is not actually about the turkey AT ALL, but about the side dishes – HELLO scalloped sweet potatoes and easy gluten free stuffing – but I think we can amend our agreement to be ALL about the DESSERTS. 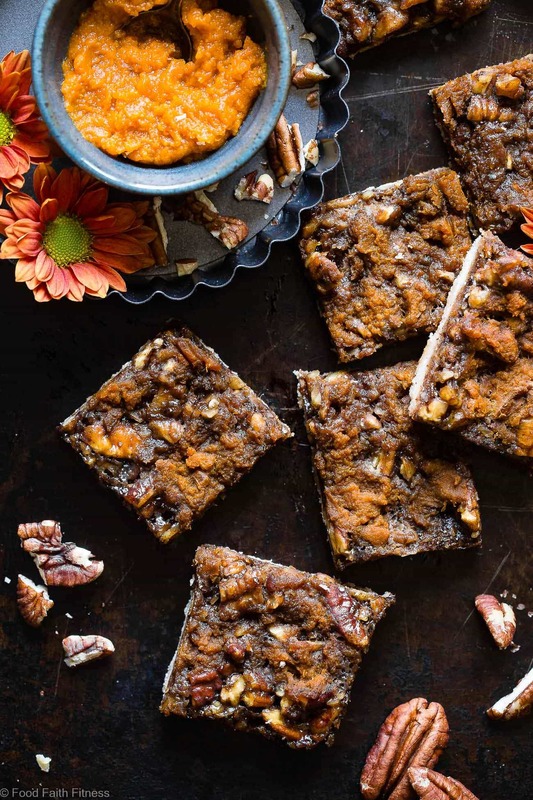 Or really, ALL ABOUT these paleo vegan pecan pie bars. Spoiler alert: making a vegan pecan pie recipe is actually REALLY REALLY hard. It takes all this rolling, cutting and having the ability to form CIRCLES of dough to perfectly fit into a pie plate. If you’re anything like me in the sense that geometry? IT IS HARD, you are RLY RLY going to like how making pecan bars nixes that pesky circular-shape-rolling shenanigans. Minimal steps to healthy pecan pie for your face? SO SO into that right now. Amoretti has also given me a new obsession: making pie flavored things that – PYSCH – are NOT pie! Last month, we ate apple paleo cheesecake with caramel with their “apple pie with crust” extract and THIS MONTH? 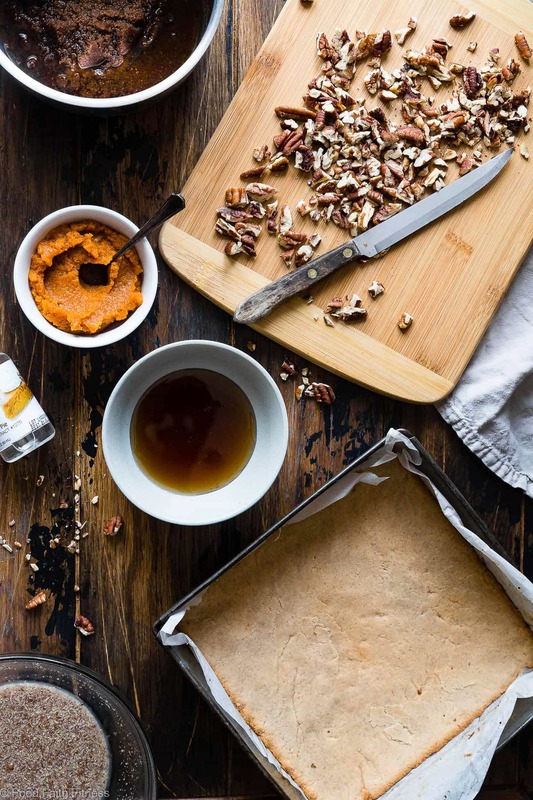 Paleo vegan pecan pie bars are coming at you with their Natural Pumpkin Pie Extract! 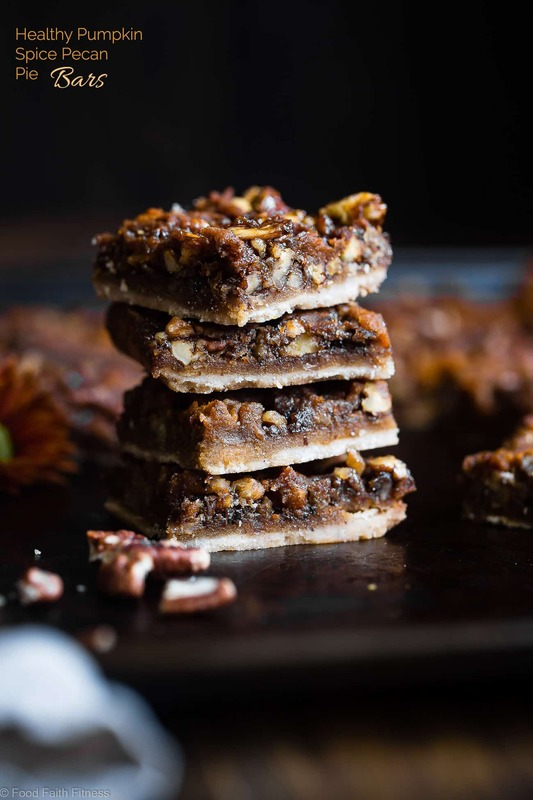 It gives these paleo vegan pecan pie bars all the fall-flavors of cinnamon, cloves and ginger that your tickles your taste buds with happy-cozy-feels but without all that SUPER weird, chunky spice-shenanigans that can happen when you mix ground spices with liquid ingredients. PLUS, pumpkin pie flavored WITHOUT the work OR not-so-good-for-you ingredients. Which is really neither here nor there, but it DOES mean that they are STUPID SIMPLE <– IE. Just what you LIKE. You DO need to chill these paleo vegan pecan pie bars OVERNIGHT. I already saw your hungry-for-pecan-pie-bars NOW minds turning and thinking you would try to CHEAT the recipe and SKIP IT. We’ve been hanging out for almost 5 years, my internet friends. I KNOW HOW YOU OPERATE BY NOW. Which means I also know that you’re going to be joining me UNDER the thanksgiving table, munching back the ENTIRE tray of these little gems. We’ve GOT THEM ON AND READY. Please read recipe fully, as crust needs to cool 1 hour and the bars need to refrigerate overnight. Heat your oven to 350 degrees and line the bottom of an 8x8 inch baking pan with parchment paper, leaving an overhang to use as a handle to get the bars out of the pan once chilled. In a large bowl, beat the maple syrup and coconut oil together using an electric hand beater until creamy and well combined. Stir in the coconut flour, pumpkin pie spice and salt until it forms a dough. Press the dough evenly into the bottom of the pan and bake until the edges are a deep golden brown, and the middle is lightly golden, about 14-15 minutes. ** Your crust will probably have risen and cracked a little bit when it comes out of the oven, use the back of a small spoon to pack it down so it’s flat and crack-free. Let cool for 1 hour before starting the topping. Once the crust has cooled for 1 hours, combine the remaining coconut sugar, maple syrup, coconut oil, Pumpkin Pie Extract and salt in a large sauce pan over medium heat and bring to a boil. Boil for one minute, stirring frequently and then remove from heat. Let the mixture stand at room temperature for 5 minutes. Dollop the canned pumpkin over top of the pecan mixture and use a sharp knife to swirl it around. *As with all gluten free baking, PLEASE weigh your flour as different brands can weigh differently for the same cup measurement. **Make sure the crust is nice and golden. You want it be really firm, or the topping will cause it to go soggy. ***Make sure you give these bars the full amount of time to chill, as this is what hardens the crust. And serve these bars cold, not at room temperature or warmed up. ****Since the topping is so sticky, it's a lot easier to slice these if you a run a sharp knife around the outsides of the pan first, before slicing into bars! AMORETTI IS BEING FAB AND GIVING 10 OF YOU A CHANCE TO WIN YOUR OWN BOTTLE OF NATURAL PUMPKIN PIE EXTRACT SO YOU CAN MAKE THESE BARS! ENTRY IS SUPER SIMPLE, JUST USE THE WIDGET BELOW! Ginger, cinnamon, and cloves make pumpkin taste SO good! I love that you combined them all into a bar with that delicious nut called the pecan. I feel like we have the same tastebuds <3 Thanks friend! These look amazing! I love the texture and I can’t wait ti make them for the holidays. 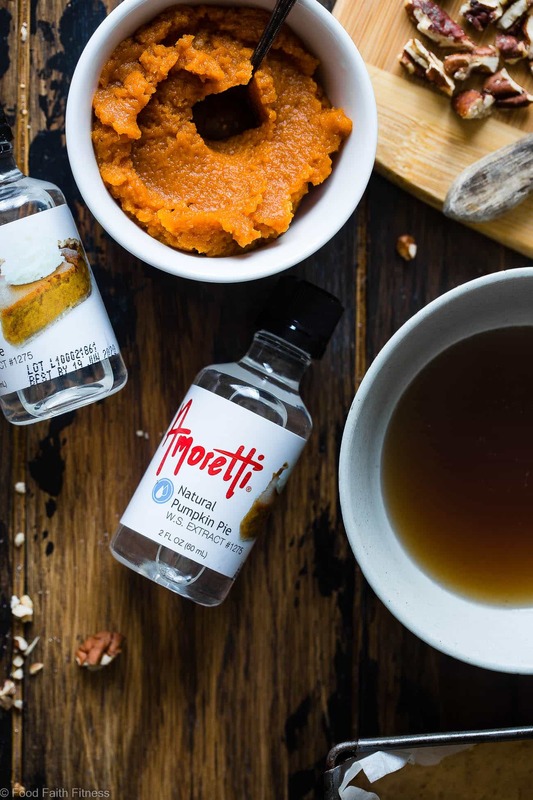 I seriously need to get my hands on this Amoretti Natural Pumpkin Pie Extract! I am SO excited that this recipe just popped into my inbox! I teach a small graduate level class on Thursdays and I always bake a treat on Wednesdays to bring to class. This one looks yummy, and I have all ingredients on hand except the Amoretti extract :(. I will head out and try to find it today. As for other recipes I will try it in, I think I will use it is a pumpkin white chocolate chip cookie recipe, instead of the granulated pumpkin pie spice. You can only get it online as far as I know!! But I hope you love these if you try them! And those cookies sound AMAZING!! Wow, do these look good!! Can’t wait to try these for the holiday season! I so hope you LOVE them Chelsea!! Your dessert bar game is on point, lady!! I love this recipe. I keep going back for another look. The only problem is that I would not be able to stop at one. Shared! Haha! I couldn’t either! Thanks so much! These look insane! Definitely need to make. I’m easing out of a Whole30 and these bars look like a great splurge! Oh my heavens these looks amazing! They are on my must make list. Wow….I’m salivating, per the usual!! I think I would just be simple with this extract and add it to one of my protein pudding concoctions I make?! HAHAHA I agree!!!! I want it on everything and everything! Hot chocolate would be amazing! These bars look so good! I wish I could grab one out of my screen and eat it! What a fun extract flavor. These bars look like a great alternative to traditional pie. Now this is my kind of holiday dessert! Waiting for those pecans to go on sale and then this is happening. You totally need to try them!! I would make ALMOND PUMPKIN BREAD PUDDING & PUMPKIN BISCOTTI!!! The bread pudding is addictive and once you taste it you will be wondering why you haven’t heard of this, why it is not on the store shelf, and how can I get more of this. LOL!!!! Thank you Taylor for all of the cool recipes, inspiration, and fun. I hope that you have a Great, Fun, Safe, and Blessed Thanksgiving!!!! Oh my gosh YUM!! I looooove bread pudding!!! I hope you do too Michael! Thank you! GIRL, never too much pumpkin spice! I could just live on your site for all the Paleo treat recipes. So much yum. These BARS! I could pumpkin spice year-round and I’m obsessed with this pumpkin pie/pecan pie hybrid bar…basically the best of all the worlds right here! Goodness these bars look incredible. Love all the spice and the flavor combination. Absolutely brilliant! No such thing as too much pumpkin spice 🙂 These look so gooey and delicious! TOTALLY agree Whitney! All the Pumpkin Spice for me! I would probably bake a pumpkin custard. Of COURSE Thanksgiving is all about the sides! Anyone who disagrees is obviously a little cuckoo. But let’s talk about these bars. They look amazing! Love the flavors here and love how simple they are. I’m definitely giving these a whirl. Can’t wait to try these Amoretti flavors. HAHA I agree at cuckoo 😉 Thank you Sabrina! I want to make pumpkin pie of course! And also pumpkin spice latte 🙂 Love the recipe Taylor. That would be SO SO GOOD! I can’t wait to try Amoretti Natural Pumpkin Pie Extract in my crepes. Maybe with a caramel drizzle.But right now all I can think of is a cup of chocolate cashew milk with a couple drops of Amoretti Natural Pumpkin Pie extract… Baby its cold outside! That sounds SO good!! Love the cashew milk idea! Yummy goodness!! I’d make a pumpkin inspired cookie. Or perhaps a pumpkin swirled cheesecake. I am loving the pumpkin AND pecan pie here. And so pretty! Mmmm…thank you for the inspiration! I am thinking of putting the Amoretti to a tastebud test in a bread pudding made with GF brioche…. I think it will be a match made in heaven! I’m pretty sure the first thing I would use this extract in is my coffee!! I think the extract plus some coconut oil in a blender would make a awesome dairy free version of a latte. Question..how many eggs would I use instead of using the flax and water? My stomach does not like flax. Unfortunately, I can’t tell you for sure with the actual eggs as recipes are only tested as written! I am sorry! This makes 2 “flax eggs” so my GUESS would be 2 full eggs! Let me know if you try it! I made this recipe and everyone loved it!! I used two eggs like your suggested instead of the flax and water. It turned out great! Thanks again! SOOOO Glad!! thanks for letting me know! If I were to use pumpkin pie extract, I would use it in EVERYTHING–oatmeal, smoothies, cakes, cupcakes, cookies, and of course, PUMPKIN PIE! Haha RIGHT! It makes EVERYTHING better!